One of the best things about summer is that families get together—often in family homes that have passed down through the generations, some getting a little shabbier with each passing decade, others fixed up finer than ever—sometimes in rental houses where a month pushes the family together closer and closer. One of the things that we do in all this “people-around” is eat—big meals, usually out on the terrace, big breakfasts of pancakes and eggs, consumed while looking out over the woods down to the Sound, the pancakes made by our beloved Steenie. Just gallons of coffee and orange juice and milk—Jersey milk from the Smith Family Farm with the heavy yellow cream still sitting up on the top—stacks of whole grain pancakes, also the Smith’s eggs scrambled up to a yellow mountain. We go the same all-out route for dinner, and by that hour of the day, Steenie and I are both tired, so it was a joy this summer when Isabel decided that she wanted to help. This involved her learning how to cook, and the recipes below are some of the ones she and I developed. 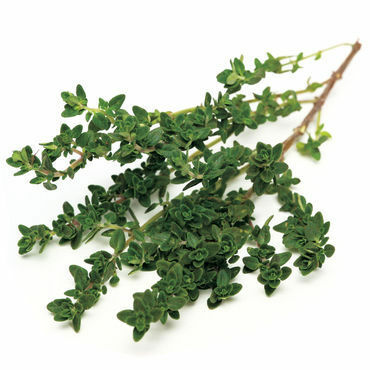 Every afternoon, Isabel would go out and cut these three herbs which we use incessantly, bring them in and cut them with a French chef’s knife. 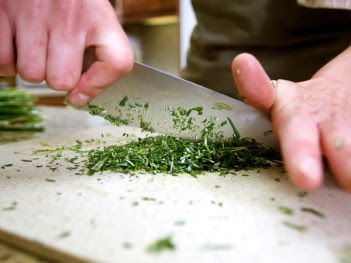 Although Paul Buese, a young chef who was our houseguest, showed her the true way to chop, guiding the herbs forward with one’s kept-together fingers, I taught her the little-less-efficient but a bit safer for the fingers method. I also showed her the simple way of peeling cloves of garlic by snipping off the ends, then lying a clove flat on the cutting board, laying the chef’s knife blade lightly on top and giving it a smack of the hand. Not too hard or you’ll smash the clove—not always bad for the recipes here. 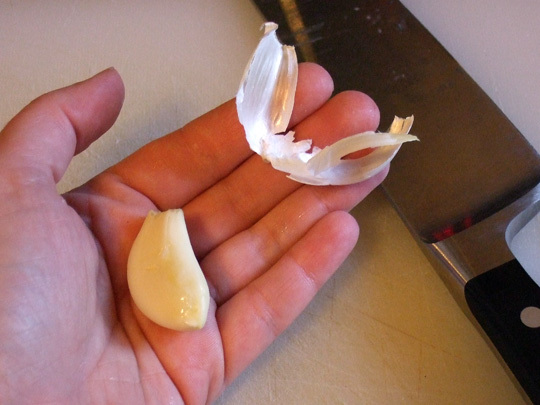 Done properly, you will end up with a perfectly peeled clove of garlic like this one. We are lucky here in that we can buy local broccoli. Wash the heads and separate into stalks keeping a nice piece of stem on each piece. Shake and drain on a clean tea towel. 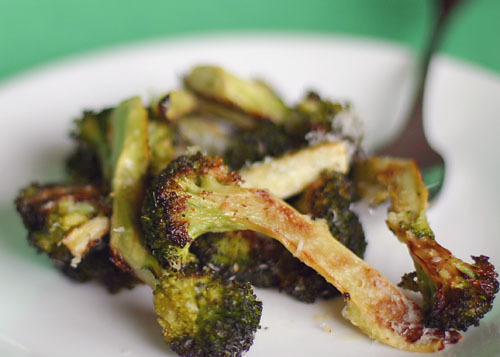 Peel at least 4-5 cloves of garlic for a head of broccoli. 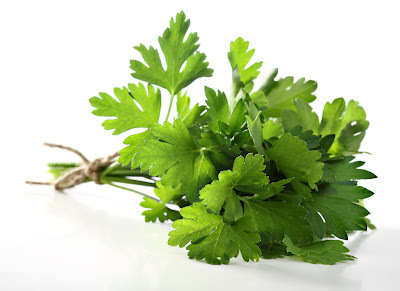 Chop the herbs mentioned above. Put olive oil in a flat sauce pan—not too much, but enough to thickly coat the bottom of the pan. If you don’t have seasoned olive oil, sprinkle with a bit of red chili pepper flakes. Add garlic, sliced or chopped barely, and brown, but don’t burn. Add broccoli spears and pan roast quickly, no more than about five minutes over high to medium high heat, adding the chopped herbs mentioned and coarse sea salt and (for us) a lot of freshly ground black pepper. Serve right away. I showed Isabel how to use the Cuisinart, but because it is a dangerous—but essential—machine, I closely supervise here. 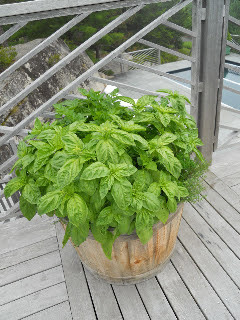 It is the best for grating (actually finely chopping) Parmesan cheese. People used to often say, “I don’t eat grits,” but today, after being served by all the new young chefs, Cheese Grits are almost de riguer. They are the easiest thing to make in my entire cooking portfolio, so there is no reason (except calories!) for not having them all the time. You can dress this recipe up by beating the hot grits with eggs, folding the entire mess into a soufflé pan, sprinkling the top with the grated Parmesan cheese above, and putting it in a hot oven for 10-15 minutes, but you don’t have to. Believe me, no matter how much you make, it will be gone. If you are a Southerner, you will have grown up on grits prepared this way, but with no cheese, served alongside fried or scrambled eggs and frizzled country ham. Cooked with the butter and salt and pepper in them, they bear no resemblance to that strange slab of library paste served in roadside restaurants. Sometimes they are embellished with crispy fried (after braising), chopped salt pork, but that’s a lot more work. Below is the basic recipe for Cheese Grits. Bring water to a boil—stir in grits—how much you do is up to you, but we never make less than 2 cups of raw grits. The ratios are on the package which you bought, and they and the cooking time vary according to the kind of grits you bought. Stir in salt and butter, then after the correct cooking time, stir in the cheese. We use a good quite sharp cheddar. The cheese can be chopped, or it can just be in smallish hunks. 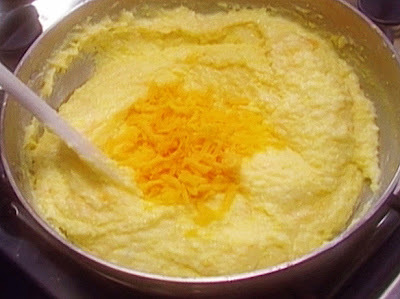 Use at least a half stick of butter (maybe more) and a cup of cheese for the two cups of raw grits. Add lots of black pepper and serve. That’s it! No excuse not to make it, especially now that you can buy grits everywhere. We used to have to bring it to Maine, but no more. and a wonderful summer pudding made from the red fruits of summer, in our case red plums and raspberries, although I also make it with red currants and strawberries. When put into a lady finger or bread-lined Charlotte mold, it is what the English call Summer Pudding. 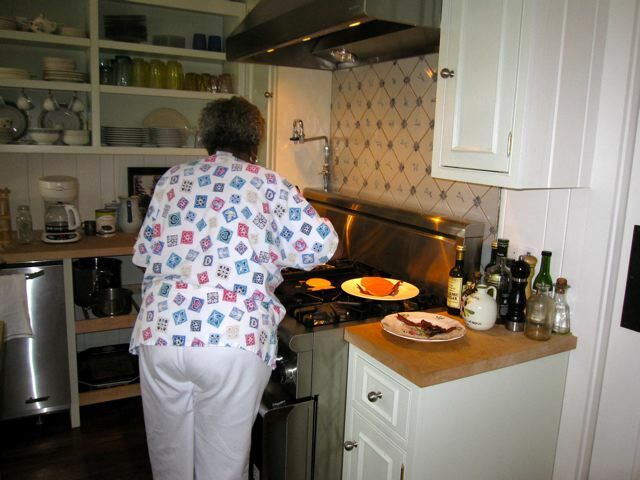 I wrote both of these recipes out for her and sent them to her by e-mail, and it was while writing them that I came up with the idea of doing a post of her leaning to cook. The language sounds a little as though I think you can’t cook. This is not a fact, but I didn’t want her to have questions when she was by herself back in Los Angeles. 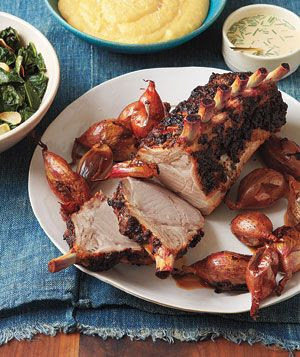 Rub olive oil over pork—even on the fatty part, but especially on the non fatty part. Sprinkle the roast all over with lots of black pepper and steak seasoning—you can buy this at Whole Foods. It’s best if the olive oil is seasoned with red chili pepper, but it’s okay if you can’t get this—remember, lots of pepper. It’s best to cook this roast on a broiler pan—that means a pan with a top with holes punched in it for the fat to drip down through. 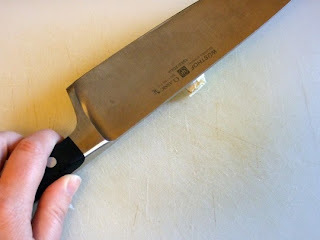 It’s okay if you don’t have this kind of pan, because the ribs will act like a dripping shelf, but it’s best if you do. Pour a cup or so of water into the bottom part of the pan—you can pour right through the dripping shelf. Carefully put the pan with the roast in the middle of the oven. It needs to cook for between 1 ¾ of an hour to two hours—if the roast is really big, you will need to cook it longer. Most rib roasts will cook in two hours. You might need to pour some more water into the pan after about an hour—get someone to help you with this part as this is when you could really burn yourself. When the meat is done, take the roast out of the oven and let it sit on the counter for a while—maybe twenty minutes. You can take the dripping part of the pan out and put carrots, spring onions (the long green kind), little potatoes, and/or apricots around in the drippings. If there is not enough, add a little more water to the pan. Make sure you stir these vegetables once or so. 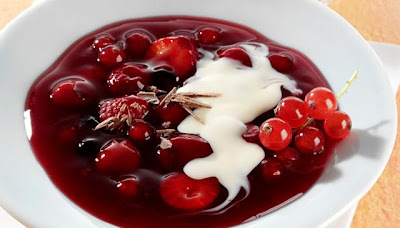 How to make rodgrod med flode—Norwegian spelling—it means “red pudding with cream”—India and I always say it the German way, but I’m not sure of the spelling—rote grutze. You will need about 5 red (not purple) plums and a box of raspberries. Put the plums in a pot with water—about half way or a little more up the side of the plums. Cook over medium heat until the skins all fall off and the plums are soft and the water is deep red. You should let them cool and take the stones out of the plums, but if you don’t feel like it, just warn people to be careful. Add the raspberries and about ½ cup or so of good sugar. Cook until raspberries are soft and falling apart—about five minutes or so. Remember: crème fraiche is equal parts of heavy cream and sour cream, stirred together very well, and left at room temperature for at least an hour or so, preferably two.